Don’t we all go to Disneyland and think, “man, I wish my living room could smell as good as Pirates of the Caribbean,” or “why doesn’t my kitchen smell like churros 24/7”? If this is something that’s crossed your mind before, then we’ve got the perfect item for you. There’s now a way to bring the smells of Main Street U.S.A. home with you. Anthology Candles has created a line of Disneyland-inspired candles. And they’re not candles themed around what the idea of Disney ~probably~ smells like, but rather the real smells you’ll encounter during a day in the park. Like, those sweet and delicious churros. 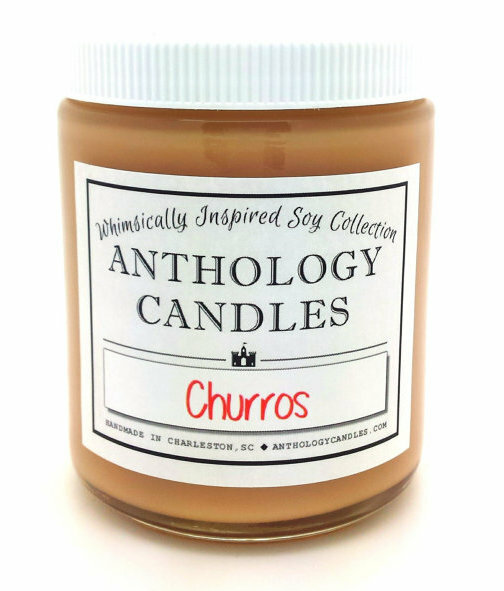 Because yes, you can really buy a Churro candle, and its scent is described as, “Cinnamon Sugar Goodness” and we’re going to need at least six of them. If you’ve ever been to Disneyland, or any Disney park, you KNOW that there are wonderful scents wafting through the air. Disneyland smells a certain way — and fun fact, this is totally intentional. Instead of smelling like a park — and I think that scene is just sweat, tears of small children, and hot sunshine — Disney spends time crafting specific scents for different locations, so when you walk into a restaurant, or a ride, it’s supposed to smell like that (and shhh I didn’t tell you this, but at places like the Main Street Bakery they actually pump in the scent of cookies and sugar so you want to buy more of them, and this works 100% of the time). The scents in Anthology Candles’s collection include such magical things like: Haunted Mansion, which smells like musty carpets, dusty furnishings, and graveyard grasses; Dole Whip, which smells like pineapple with a hint of coconut; and Belle’s Library, with the smell of aged library books, hint of leather, and wild roses. As you can probably imagine, demand for these candles has become INTENSE. Their website actually crashed after word got out about them, and it’s unfortunately not back up yet. BUT! They’ve also got an Etsy shop, too. The candles sell for $16 a piece, but if you buy more than one you’ll save a little bit. However, the wait to get your hands on one of these is currently 2-4 months. That’s okay. We’re willing to wait as long as needed for a Churro smelling apartment.